Three weeks ago, Estonians thought they were about to witness history – the country was on the verge of electing its first ever female Prime Minister. Chairwoman Kaja Kallas and the liberal market-oriented Reform Party were dubbed the irrefutable winners of the parliamentary elections, taking 28% of the vote and 34 seats in the Riigikogu. 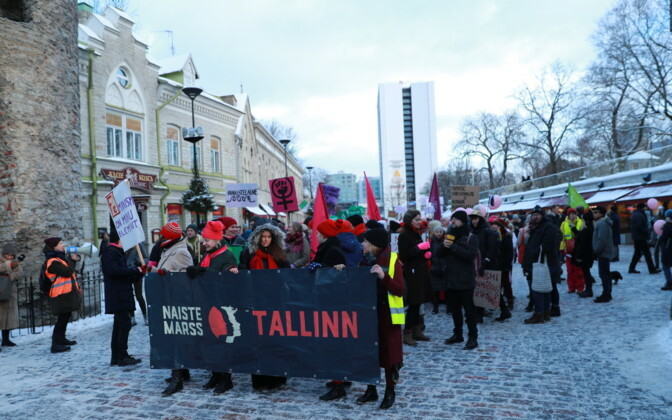 The elections wrapped up an unprecedented few months for the political representation of women: female politicians chaired three of the seven major parties in Estonia, and Tallinn had just hosted its first-ever Women’s March in January. To top it all off, Estonia experienced a miniature pink wave on March 3, when 27 women were voted into parliament, the highest number since the Riigikogu elections of 1992. Then, on March 11, three days after International Women’s Day, the runner-up Centre Party snatched the wind from Reform’s sails, announcing the start of coalition negotiations with the two most electorally-relevant conservative parties of the Estonian political landscape: Isamaa and EKRE. The bid provoked outrage since Centre Party chairman Jüri Ratas had stated before the elections that he would not work with EKRE, a party considered by many to be racist, sexist, regressive, and even fascist (read more about the EKRE here). Some Centre politicians, such as Raimond Kaljulaid, perceived the move as a betrayal of the party’s ethnic Russian base and have since been outspoken about their opposition to the proposed coalition. By inviting EKRE to government negotiations, the Centre Party has enabled the party’s reactionary leaders, lent the party greater public attention, and indirectly legitimized their retrogressive views on women. The coded official language implied that Kaja Kallas was not fit to form a government, suggesting that her consultations had carried on too long, as similar debates had recently in Sweden and Latvia. In reality, Kallas had less than 10 days before the rug was unfairly pulled out from under her, and there is no doubt that her accommodating, cooperative (and different) political style, as well as her gender, played a role in that. Estonian-language media have been rife with commentary about how Kaja Kallas’ gender played a role in the aggressive maneuver by the Centre Party to displace her and the Reform Party, but the media have also be complicit in reinforcing stereotypes. In an interview, Social Democrat party (SDE) member Triin Toomesaar pointed out the fact that when the media describe Kallas, they often feel the need to label her as “Siim Kallas” [the former Reform Party chairman] daughter” rather than let her stand on her own as an influential politician. Kadi Viik, one of the co-organizers of the January Women’s March in Tallinn, remarked in an interview: “I’ve heard from a person that participates in the current government coalition talks that [the parties] have discussed [whether] anything would be wrong with women staying at home and only men working…[the coalition] will seriously affect women everywhere if there are people in the government who question women’s right to work.” Despite the efforts by Ratas to tone down the rhetoric and policies of EKRE, the party still maintains categorically views from Isamaa and Centre on issues of ethnic Russian citizenship, the registered partnership act, and partial state funding for abortion. Offensive comments by EKRE chairman Mart Helme and deputy chairman Martin Helme about gynecologists and women have stirred the pot and fostered further suspicion about the degrading effects that EKRE will have on liberal progress in Estonia if the party becomes a part of government. The recent upheaval in Tallinn has brought to the forefront a number of women’s issues, such as the gender pay gap and violence against women, that have long simmered under the surface for Estonian society. The recent elections tell two completely different tales. On one hand, we should celebrate the greater representation of women in Parliament. On the other hand, it is difficult to ignore the undercurrents of misogyny and sexism that continue to influence the political landscape. The steep drop in the popularity of the Centre Party, as shown by a poll released at the end of March, may be the first indication of the casualties caused by the decision to engage in negotiations with EKRE. Voters remain staunchly opposed to the negotiations between Centre, EKRE, and Isamaa, which have waffled slightly, and the Reform Party remains optimistic about forming a government. Even if the negotiations take a turn for the better and the Reform Party recovers their leverage, it would be naive to ignore the damage done to voter confidence, women’s empowerment, and faith in government.